Looking for last minute gift ideas can be so stressful, but did you know you can give the gift of an online craft class? All classes are discounted now through Saturday, 12/26/2015, so shop NOW! Craftsy has hundreds of online classes that you can purchase and give as gifts for mom or anyone interested in learning a something new! Give the gift of a learning a new beading or jewelry making technique! My favorite, of course are the jewelry classes! You can learn all the basics of jewelry making in the Jewelry Workshop class or select a more focussed skill from one of the 35 jewelry classes and it will be delivered right to your in box! These online classes are so cool, you can learn at home and at your own pace by taking craft classes on a computer or mobile device. Easy to follow HD video lessons give step by step instructions, materials needed and more. Learn wire wrapping, metalsmithing and so much more! Not clear on one of the lessons? No problem, you can leave a question for the instructor and receive personalized instructions. Learn something totally new from the convenience of home! The best thing of all is that these classes are there for you forever! You can access them anytime or anywhere if you need to refresh your memory on a certain technique. This Holiday Gift Guide is the ultimate guide to unique gifts that are handmade from the talented members of The Artisan Group. This gift guide includes a variety of gift ideas for women which includes handcrafted jewelry, aromatherapy and bath gift sets, and even a Christmas bow for dog collars! No matter who is on your gift list this year, find just the right gift for them at these Etsy Shops where each item is made from the heart! Landmark Charm Beads or European bead for bracelets make great gifts for women and are available to add to travel bracelets as sterling silver memories! They are compatible with Pandora, Chamilia, Carlo Biagi and all of the different brands of trendy European style bracelet chains. There are currently over 70 different highly detailed Landmark beads representing locations from around the world and the United States. Landmark charm beads make great gifts for travelers, gifts for Mom, girlfriends and anyone who loves to travel. There are currently over 70 highly detailed Landmark beads representing locations from around the world and the United States. You can find the Landmark Straatsoper Vienna Opera House pictured above, as well as the Landmark Istanbul Blue Mosque or the Landmark Budapest Fisherman’s Bastion shown in the featured image on our website. A the variety of Landmark Beads from around the world and locations in the United States are available on our website. The variety shown on the website may not always be the same since occasionally they are out of stock. Please feel free to contact us with any questions you might have about these stunning charm beads! Cell phone charms used to be all the rage! That was a short-lived trend because newer cell phones have no place to hook them. Meanwhile crafters and bead suppliers have jillions of them left over. Likewise, when I was trying to sell my wares at local craft shows years ago, I created some cell phone charms with an assortment of really nice sterling silver bead designs and Swarovski crystal. Guess what? I still have some of them! They are nearly impossible to sell since no one is interested in them any longer. So what do you do with them now? I love incense and have several types of incense burners in my home, including bottle incense holders. They come with a large split ring and golden cord that hangs on the side. You put the incense stick into the split ring and then insert the stick in the bottle so that the smoke comes out of the top and the ventilation holes on the side. Over the years the silver split ring had become blackened from the smoke and the little golden cord had become frayed. So I took one of those unwanted cell phone charms and attached it to a new split ring. See how nice it looks?!! What great ideas for decorations with beads have you had lately? Leave a comment below, I would love to hear your ideas! Bead pendants are a stunning way to display European beads that you are no wearing on your charm bead bracelet. Highlight a favorite bead with this innovative pendant for large hole charm beads. These affordable pendants are made from high quality brass and plated with a thick coat of precious rhodium. A striking and elegant addition to your European Bead jewelry collection. Everyone knows that you can only put so many European beads on a bracelet, so why let unused Pandora style beads sit in a jewelry box? These innovative pendants will hold those beads that have been cast aside and give them a fresh, new look! The flower and round shape have a reflective background which enhances the color of decorative glass or sparking crystal beads. These pendants are compatible with Pandora, Chamilia, Troll and other large hole European charm beads. Revive old beads or highlight new ones while also creating a unique customized pendant to match your bracelet. This info graphic illustrates how to use a coin holder necklace and how easy it is to change and create personalized custom jewelry. Coin holder pendant necklaces make great gift ideas for women and have a large variety of coins to match any wardrobe! 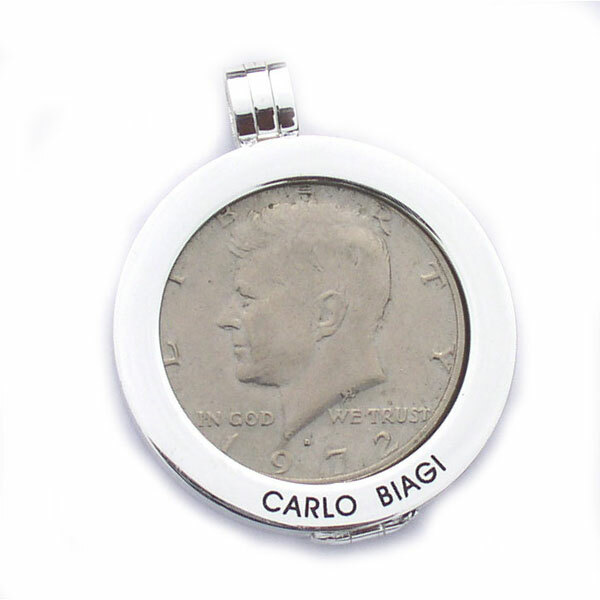 The Carlo Biagi coin holder pendant can also be used with an American fifty cent piece. 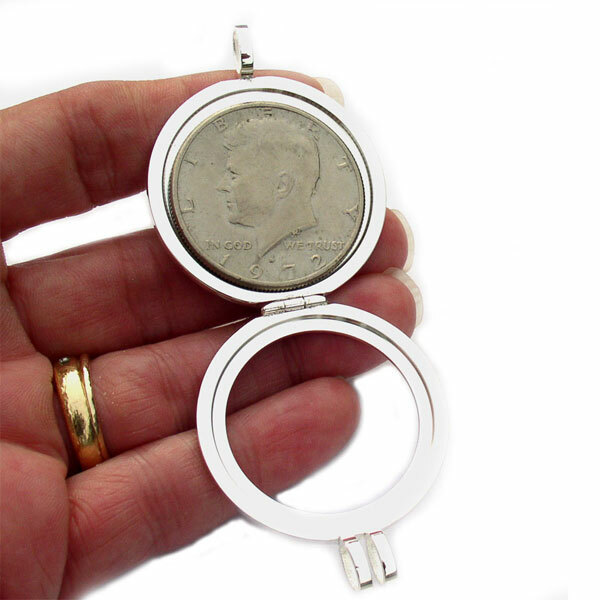 Open the Carlo Biagi coin holder and insert a United States 50 cent piece (half-dollar coin). Close and attach to necklace chain. Coin holders are available in three finishes, silver plated, yellow gold plated and rosegold plated. They are also available with sparking cubic zirconia stones, check out all of the coin holders are Bead Lovers Korner!